At the welcome reception of the Atlantic States Marine Fisheries Commission’s 71st Annual Meeting, the Atlantic Coastal Fish Habitat Partnership bestowed the first Melissa Laser Fish Habitat Conservation Award upon Dr. Wilson Laney of the U.S. Fish and Wildlife Service for his exemplarily work in furthering the conservation, protection, restoration, and enhancement of habitat for native Atlantic coastal, estuarine-dependent, and diadromous fishes. Dr. Laney has served on the Atlantic States Marine Fisheries Commission’s Habitat Committee for nearly two decades, and has served as its Chair. 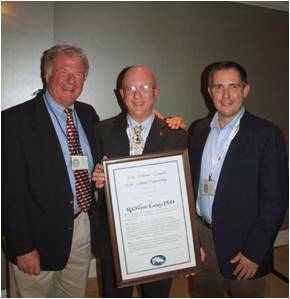 He was instrumental in the creation of the Atlantic Coastal Fish Habitat Partnership and serves on its Steering Committee. He has been a key contributor to a range of important Commission and Partnership products and has played a vital role in bringing together management initiatives at the Federal, state, inter-state, and local levels. Dr. Laney possesses a deep commitment to conservation, a keen attention to sound science as the basis for resource management, and a friendly and engaging personality, qualities that embody Dr. Laser’s own dedicated approach towards fish habitat conservation. It is with great pleasure that the Atlantic Coastal Fish Habitat Partnership presents Dr. Laney with the first Melissa Laser Fish Habitat Conservation Award.